Organic. 29 kcal per serving. High protein. Suitable for vegans.Miso is a traditional Japanese fermented soya seasoning that makes a rich, satisfying soup. 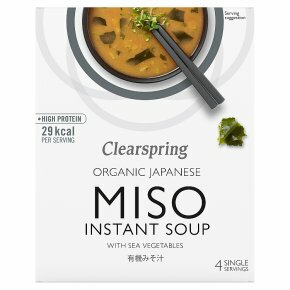 Clearspring authentic and umami rich organic miso soup is made in Japan without MSG, added sugar or artificial flavourings. To prepare, empty the contents of one sachet into a bowl or cup and add 1 cup (200ml) of hot water. Stir well and enjoy hot.